In the mid 1980’s, I had a job driving 18 wheelers half way to Los Angeles from the San Francisco Bay Area and back. Five nights a week, twice each shift, I went past Harris Ranch in Coalinga, California. At the time, I was reading up on European history and watching documentaries on the WWII Holocaust. 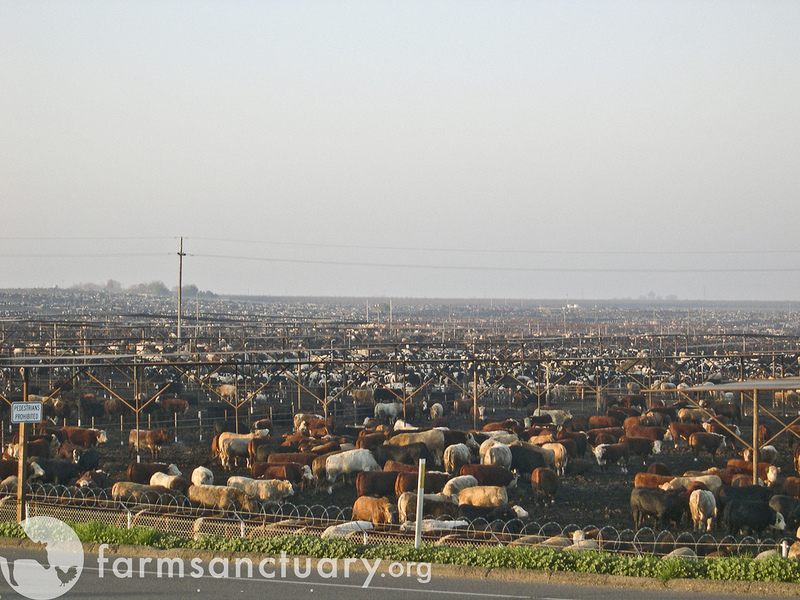 As I drove by Harris Ranch and smelled the stench of the seemingly endless stretch of confinement pens where huge numbers of cattle were held, the term “cowschwitz” immediately came to mind. I often wondered why more people did not make the connection of these imprisoned animals to what happened to so many European Jews, gypsies, gays, disabled folks and others during WWII. But most people did not drive by a huge feedlot 10 times a week, especially not while learning about concentration camps. In those days, I was not vegan. I was not even vegetarian. That would soon change. On the highway, you see a lot of things. One morning, I was stuck in traffic next to a flatbed truck hauling cages of live chickens. Some of the birds were positioned on their heads and unable to right themselves due to the tiny cages packed with multiple chickens. It was sickening to look at. Without realizing it, I found myself taking the next exit so that I would not have to be next to them any longer. I still wasn’t quite vegetarian yet…what would it take? Another night, I was headed South toward Los Angeles on Highway 5 when suddenly in my headlights, I saw a cow (steer?) lying in the lane in front of my rig. She was bloodied all over and obviously unable to move. She looked up at my oncoming vehicle as if to ask, “Are you going to hit me too?” I somehow managed to maneuver my rig around her without doing further damage to either of us. As soon as I got past the horrible scene and found some room off the highway, I pulled over and sobbed. I felt so helpless to do anything for her. Cell phones weren’t around yet. I heard the report coming over the cb that the police were on the way and I pulled myself together to continue South. It wasn’t much later that I began cutting meat out of my diet. Around the early 90’s, I made friends with a coworker who used to drive a tanker truck out of Los Angeles. Hearing that I was vegetarian, he disdainfully told me about some of the loads he had delivered to cattle ranches over the years. He had hauled items such as rancid salad dressing and expired medications that were added to cattle feed as a convenient means of disposal. At first I found this hard to believe, but he reassured me that it was true. We are still good friends to this day. Ten years later in 2002: I no longer drove 18 wheelers. I had been vegan for some time and decided to attend a Farm Sanctuary Hoe Down in California. During lunch, the subject of animal agriculture came up and I shared my perspective on Harris Ranch and the confinement of cattle. I had never shared my concentration-camp perspective from those long nights on Highway 5 before. It was a relief to have people around who understood my “Cowschwitz” connection – especially over lunch. The intensive large meat, dairy and poultry industries want the truth about animal cruelty to be kept secret. What have you observed? Aside from small farms that might permit their animals to graze on green grass and be in the sunshine, have you witnessed any dark secrets of the large animal agriculture industries that you are willing to share? Please comment if you have some thoughts or observations of your own. Exactly, I draw the same connection and thank you for raising the discussion– The feedlots and confined feeding operations(CAFO) used today by the meat industry makes the Holocaust look like summer camp really–60 Billion farm animals a year worldwide are slaughtered, and yet not one has any protection under the law –there are NO laws protecting these animals from the horrible abuse the meat industry wants to inflict to make a dollar– these gentile and loving creatures are forced to endure and produce day in day out and never get a day off — these animals have been so genetically modified that they grow abnormally fast that their bone structure can not support the modified muscle mass– Chickens are born raised and killed in five weeks–these are babies, cows and pigs grown in half the time–these are mere babies going to slaughter– 11 billion babies killed yearly in the U.S.A. alone–babies that never new comfort, or their mothers. NO love NO tenderness only Stress and FEAR for their short lived lives until they get their throats ripped out or are scalded alive. The Nazis did experiments and killed millions of people, and today I believe this mind set is still operating today–Corporations have person hood and now have rights under the law, but living, breathing, SENTIENT animals do not– this is a crime where corporate atrocities flourish–Tyson and Cargil makes the Nazis look like boy scouts when it comes to inflicting pain, suffering, and mass murder upon a species of animal for profit. Nothing more than objects mere property under the eyes of the law farm animals are slaves to the industry and they need protection from those who want to skin, gut, and consume their flesh. This is the type of information the public should know more about..being Vegan has it’s benefits truly. I agree. It’s particularly difficult because the public gets used to seeing places like Harris Ranch on the side of the road. Unfortunately, most people just notice their own discomfort from the stench and do not think about what the animals must endure 24/7.